Reviewing and recommending any new home video release of Mad Men is an absurdly easy task. This is the best series on television, and continues to set a very high bar for TV on Blu-Ray. 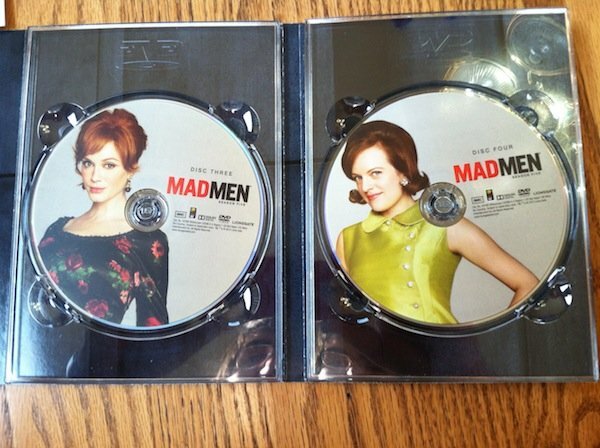 Reviewing and recommending any new home video release of Mad Men is an absurdly easy task. This is the best series on television, one of the single greatest dramas in the history of the medium, and among the smartest and most meaningful works of art, in any format, of the modern era. AMC and Lionsgate have always recognized this by putting a staggering amount of effort into the home video packages, delivering flawless video and audio and assembling hefty, invaluable archives of bonus material. None of that changes with the show’s fifth season. This is, arguably, the series’ most creatively ambitious and successful run to date, and the Blu-Ray and DVD releases are just as rock solid as ever. Mad Men Season Five is a must-own release on either format, continuing to set an insanely high bar for television on home video. I wrote lengthily, analytical essays about every episode of the season when they aired this spring over at my old website, and I would direct you to those for the best and most complete analysis of the fifth season. Writing about these episodes was an extremely challenging and rewarding experience, which speaks strongly to what an incredible job creator Matthew Weiner and his team did this year. Season Five is more formally experimental than its predecessors, with individual episodes, like Far Away Places, that forego structural familiarity in favor of more lucid, provocative storytelling. The same holds true for the season as a whole, which is less concerned with overarching plot than in years past. Some viewers found this structure detrimental, but I feel the enhanced focus on character exploration – which is, by its very nature, a more dense and ethereal subject – served the show spectacularly. Though the season ties together very strongly in its final hour, this year is more about the journey than the destination – it emphasizes, in fact, that ‘destinations’ are narrative constructs that cannot reasonably exist in reality – and observing how these characters move through an increasingly complex and changing world is simply fascinating. Supporting players like Roger, Pete, Lane, and especially Joan get the most enticing material, in fact, as each is pushed in darker or more confusing directions than ever before. Don and his new wife Megan – played wonderfully by new regular Jessica Paré – certainly have an extremely interesting and challenging arc that ends on a series of beautifully ambiguous grace notes, but this season really is more of an ensemble show than ever before, and if anything, the show only improves by spreading the dramatic wealth. Some may be perturbed by the diminished role previous co-lead Peggy Olsen plays this year, but it speaks to the strength of both Elizabeth Moss and the writing that even with a smaller presence, Peggy remains the show’s most entertaining and dramatically satisfying character. She sits at the heart of many of the season’s best episodes, delivering more of her wonderfully funny or insightful one-liners, and Moss’s utter confidence and conviction in the part is astounding. The Blu-Ray is housed in a standard amaray case and plain slipcover, while the DVD uses a two-tiered slipcover/digipack design to present a more complex cover design, and features more artwork and information on the inside. 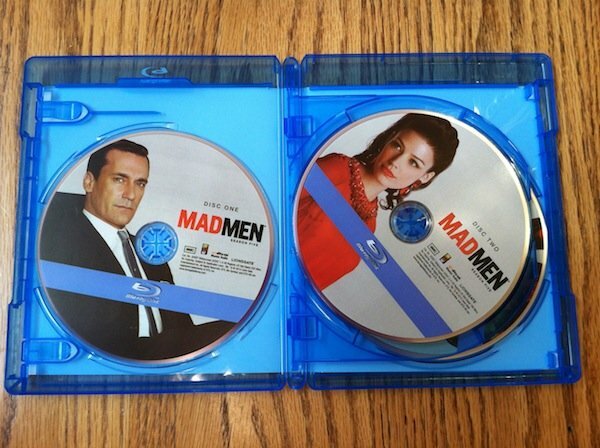 I prefer the simplicity of the Blu-Ray design – it’s tougher to access the discs on the fold-out DVD package – but the Blu-Ray also lacks the Episode Guide included in the DVD, and feels cheaper and less substantial in overall comparison. Not a huge issue, but one worth noting given how much better the Blu-Ray experience is as a whole. And I am, I will admit, a tad disappointed that Peggy does not get her own disc on the Blu-Ray set, though that is a product of my own personal bias. As for the discs themselves, the Blu-Ray features 1080p high-definition video and 5.1 DTS-HD master audio, and as always looks and sounds spectacular. 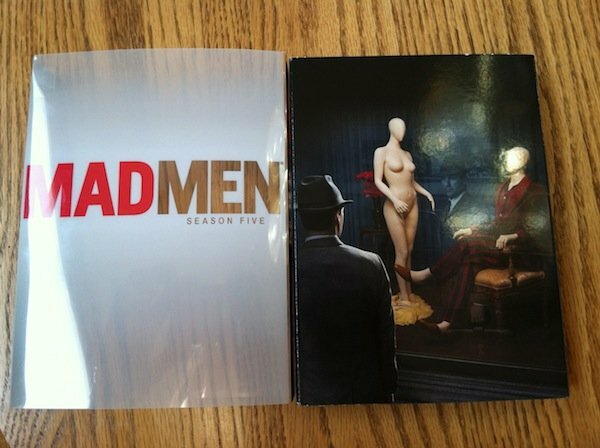 Mad Men, along with fellow AMC series Breaking Bad, is the best looking show on TV, with incredible production design and cinematography, and the Blu-Ray, as always, shows off every minute, splendid detail. Color reproduction is dazzling (though Season Five is, intentionally, ever so slightly cooler than previous years), with warm, rich hues and thoroughly realistic facial tones. Textures are uncannily vivid and palpable, while fine detail and depth are always strong. One may notice slight digital noise from time to time, but otherwise, Season Five looks as flawless as its predecessors. The same goes for the soundtrack. 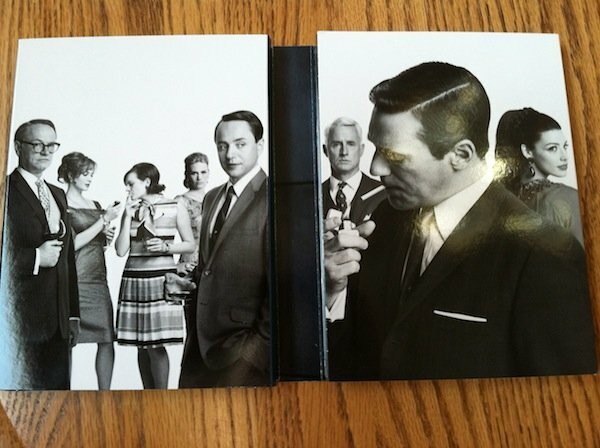 Mad Men is not an overly busy show aurally, but the 5.1 track does a tremendous job presenting all the subtle, nuanced aspects of the sound design, like background chatter and movement. Directionality is exquisite, even if the surround channels rarely receive a hefty workout, and music – always a highlight of Mad Men – sounds excellent whenever it comes in. The use of the Beatles’ “Tomorrow Never Knows” at the end of Lazy Lazarus is a particular knockout. Dialogue, the show’s most important aural element, sounds natural and refined, and is perfectly balanced in the mix. Mad Men may not reinvent the sonic wheel, but no one would mistake this track for a ‘lossy’ offering; it sounds great in ways only Blu-Ray can deliver. The DVD is obviously a big step down from Blu-Ray high-definition in both departments, but is still top notch for standard definition. Those who have yet to upgrade to Blu-Ray will be satisfied, though Mad Men is ample incentive for all buyers to one day make the leap. Bonus Features are identical on both releases, though video extras are presented in high-definition on Blu-Ray. The main attraction here is, as always, the cavalcade of Audio Commentaries – one or more for every single episode – which continue to be high in quality and unwieldy in number. What I sampled is, as always, very fun and insightful to listen to, though I think the set would be served better if certain commentaries were combined. On the premiere, for instance, one commentary features Weiner and director Jennifer Getzinger, while the other has Jon Hamm and Jessica Paré. Both are good, but Hamm and Paré have so little to say relative to Weiner that their track feels unreasonably thin, and putting everyone in one room would, I think, make for a more compelling listen. Video features, meanwhile, continue to focus more on historical context than behind-the-scenes footage, which is disappointing until one considers that the commentaries probably answer every single production question one might have. I like that Mad Men releases do delve into the history of the sixties, especially for younger viewers who may not automatically understand some of the larger social implications of the narrative, and this season’s featurettes once again impress and educate to valuable degrees. Like I said at the beginning, reviewing a Mad Men home video release is not difficult. 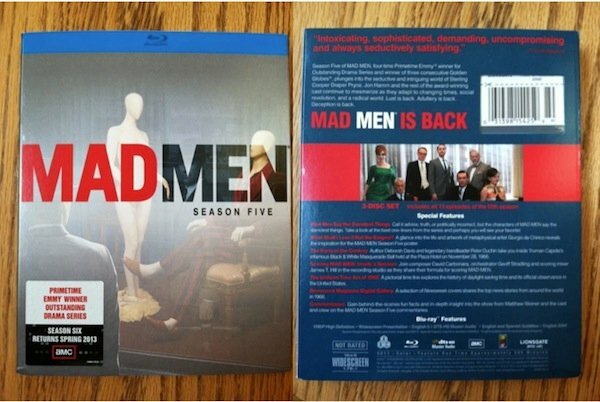 Season Five is spectacular, and the Blu-Ray and DVD releases match up in just about every conceivable way. If you love the series, do not hesitate to continue filling your collection. If you are a newcomer, start at the beginning instead of Season Five, but rest assured that you will completely satisfied once arrive at this excellent release.